Alexander Jones studied Classics at the University of British Columbia and the history of the ancient mathematical sciences in the Department of the History of Mathematics at Brown University. Before coming to NYU, he was for sixteen years on the faculty of the Department of Classics and the Institute for the History and Philosophy of Science and Technology at the University of Toronto. His work centers on the history and transmission of the mathematical sciences, especially astronomy. His most recent book is A Portable Cosmos: Revealing the Antikythera Mechanism, Scientific Wonder of the Ancient World (Oxford University Press). 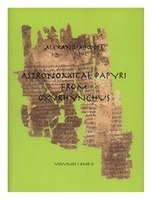 He is also the author of several editions of Greek scientific texts, among them Pappus of Alexandria's commentary on the corpus of Hellenistic geometrical treatises known as the "Treasury of Analysis"; an anonymous Byzantine astronomical handbook based on Islamic sources; a collection of about two hundred fragmentary astronomical texts, tables, and horoscopes from the papyri excavated a century ago by Grenfell and Hunt at Oxyrhynchus; and (in collaboration with members of the Antikythera Mechanism Research Project) the astronomical, calendrical, and mechanical texts inscribed on the Antikythera Mechanism. His current research interests include the contacts between Babylonian and Greco-Roman astronomy and astrology, the Antikythera Mechanism and other artifacts of Hellenistic and Roman period astronomy, and the scientific work of Claudius Ptolemy. He is a member of the American Philosophical Society, a fellow of the Royal Society of Canada, a full member of the Académie Internationale d'Histoire des Sciences, and recipient of several awards and honors including a Guggenheim fellowship and the Francis Bacon Award in the History of Science. Together with Christine Proust, he curated ISAW's 2011 exhibition on Babylonian Mathematics, Before Pythagoras, and he also curated the 2016-2017 ISAW exhibition Time and Cosmos in Greco-Roman Antiquity.